This is a case analysis for patient shown in the blog Sientra 107 Breast Implants for Breast Augmentation. As discussed in the post, Sientra 107 breast augmentation silicone gel breast implant is the latest implant introduced by Sientra. It contains their proprietary silicone gel HSC+ (high strength silicone). The HSC+ gel is more sticky (cohesive) than other gels and helps the implant to maintain their shape. This helps the implant to give more projection, upper pole fullness and less wrinkling. This patient has a very nice shape to her breasts. The Vectra Imaging System was used to assess her breasts. She has mild asymmetry with very similar breast volume. Her main issues for me was the lack of fullness in her upper pole of her breasts. This is the Vectra Imaging System before and after Sientra 107 breast augmentation with aHSC+ 285cc silicone gel breast implants. I used a 285cc moderate profile plus Sientra 107 silicone gel breast implants for her breast augmentation. This implant has a diameter of 11.4cm and with 4 cm of projection. The diameter I selected is less than the diameter shown by the Vectra analysis. Her actual breast diameter is less than measured. You can see on the chest image that that she has signifiant breast tissue for her chest size. 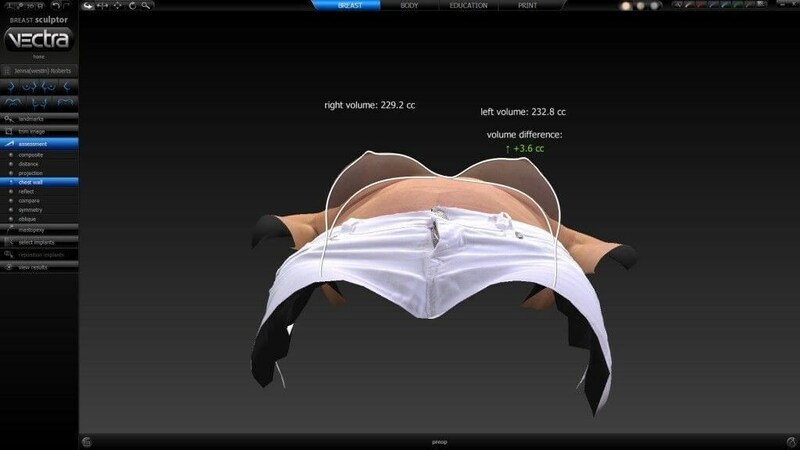 This will over estimate the chest measurement by Vectra. Another implant option is a Natrelle Inspira SRM 275cc with base diameter of 11.5cm and 3.9cm of projection. I believe this implant would have given similar results. Sientra 107 Breast augmentation with submusclar placement of a 285cc moderate profile plus silicone gel breast implant through a breast fold incision.